Enjoy Tropea - The Prettiest Town of Calabria, Italy? One of the prettiest towns in Calabria, Tropea is ringed by rugged cliffs, jagged coast, and crystal sandy beaches. Lying on the Tyrrhenian Coast in the Vibo Valentia province, the promontory enjoys a majestic location above sea, with its emerald green waters, cliffy bays, and fine sandy beaches being the biggest attraction. The history-charged town takes pride in its rich history, tradition, and folklore, with 17 churches and 50 noblemen’s palaces that continue to attract hordes of tourists. The splendid town, towering high over the beach with its old palazzi built in golden stone, offers panoramic views of the peculiarly colored sea, the cone of Stromboli, and the Aeolian islands on a clear day. It is also the most fashionable seaside resorts in the Calabrian region, which has kept its amazing seaside charm and beauty intact despite the annual influx of tourists. The town, overlooking azure waters of the Tyrrhenian Sea, boasts sun-soaked beaches within an easy walking distance from the center, which have remained the focal point of tourism here. The Pearl of the Tyrrhenian Sea, the town enjoys a pristine location on the map of Calabria, which has made it an important tourism center in the country. Its historical center is interspersed with lanes, ancient portals, aristocratic buildings, churches, bars, restaurants, and café. The portals of buildings belonging to the nobles continue to be the center of attraction in the historic town, with some equipped with big tanks dug into the rock. A famous bathing place for tourists, this jewel of southern Italy is situated on a reef linking the mainland by a narrow strip. It’s hard to think of another town in Italy that boasts such a magnificent presence of sun, sea, sand and history. Cattedrale: The old Norman Cattedrale stands out in the town’s harmonious warren of lanes telling tales of ancient times. Once a 16th century Norman temple, this ancient Tropea church has kept intact its beautiful interiors that were destroyed in the devastating earthquake. The interiors display unexploded bombs from the Second World War, with each attached to a thankful prayer to the Madonna. Renovation has restored the traditional artistic form of the church, which houses a silver-framed canvas of the Madonna of Romania on the high altar. Santa Maria dell'Isola: A Benedictine sanctuary, Santa Maria dell'Isola sits on top of a stunning promontory standing on a beach above an aquamarine sea. Dating back to the medieval times, the Gothic style church houses an attractive image of Madonna di Romania, with a remarkable facade, decked with horizontal stripes. The path to the church is dotted with caves of fishermen. The interiors also house fragments of medieval tombs and three grand round-arched doorways. Frescoes, beneath the porticoes, clearly depict the history of the coenoby. Begin you day exploring the local churches and then walk down toward the inviting, intensely blue sea and soak your feet into soft white sand. In the evening, climb those steps again and watch the sun setting over the horizon – a breathtaking sight to be captured in your camera. 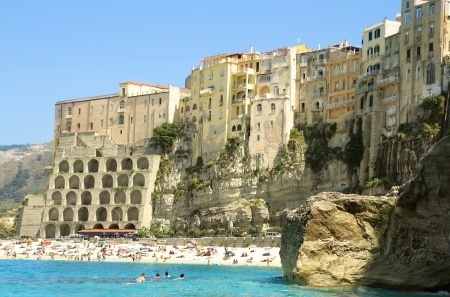 Tip: Tropea is not the only attractive town in Calabria!